Nicknamed the 'Russian Wolfhound', the Sleek, elegant Borzoi was bred to hunt wolves and to course game. 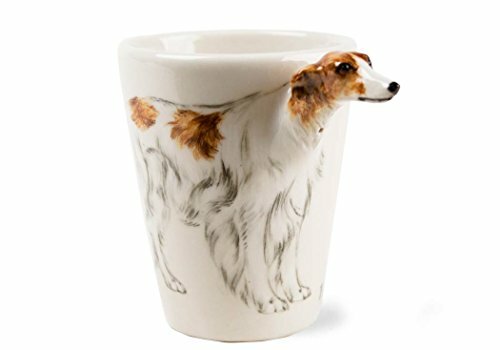 Beautifully depicted on this handmade, hand painted Blue Witch mug, the Borzoi is mostly affectionate, quite docile and can sometimes appear aloof. Product Dimensions: 10cm x 8cm. Capacity: 200ml / 8oz. Our mugs are versatile and useful. They can also be used as a unique vase, plant pot, pen, sweetie or toothbrush holder or as a standalone decorative piece. If you have any questions about this product by Blue Witch, contact us by completing and submitting the form below. If you are looking for a specif part number, please include it with your message.